This entry was posted in Bread, courses, essex, Hertford, hertfordshire, Uncategorized and tagged Christmas, gifts, Panettone, Stollen on October 23, 2017 by tridenthousebandb. 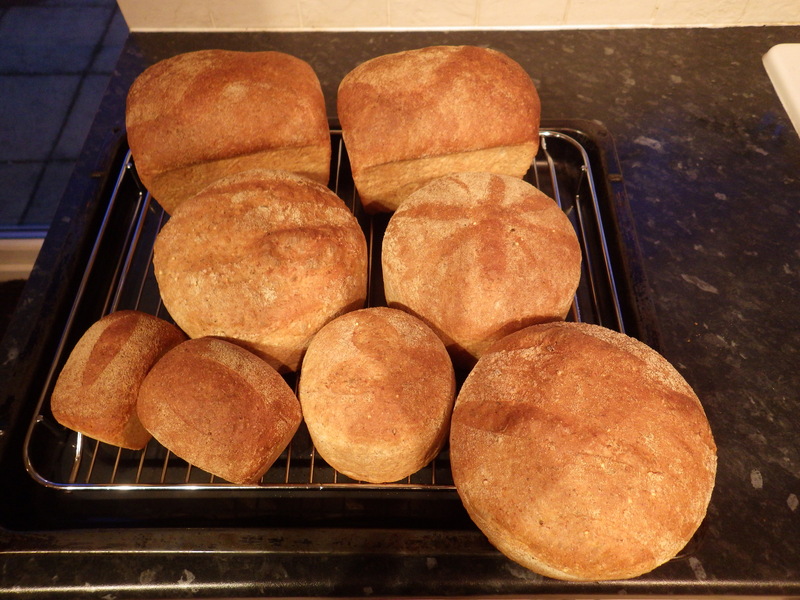 Having recently retired, I am no longer delivering bread classes commercially. However, I am running classes and workshops for charities, most recently for Mudlarks in Hertford. Our next one is Sunday 29 October and features Christmas Breads and we may run one closer to Christmas (Sunday 17 December) if there is sufficient demand. More detail below and you can register with Kevin: kevin@mudlarksgarden.org.uk. Panettone and Stollen are classics but have you ever tried to make them? What about a Swedish Kanellängd, which featured on Christmas Bake-off last year? Choosing two of these three we will show you how to deal with these very soft, enriched doughs so you can turn out these attractive and tasty breads. This entry was posted in Uncategorized on September 25, 2017 by tridenthousebandb. This entry was posted in Bread, courses, Hertford, hertfordshire, home made, Uncategorized and tagged ciabbatta, focaccia, italian on September 18, 2017 by tridenthousebandb. Our first course with Mudlarks cafe went really well. 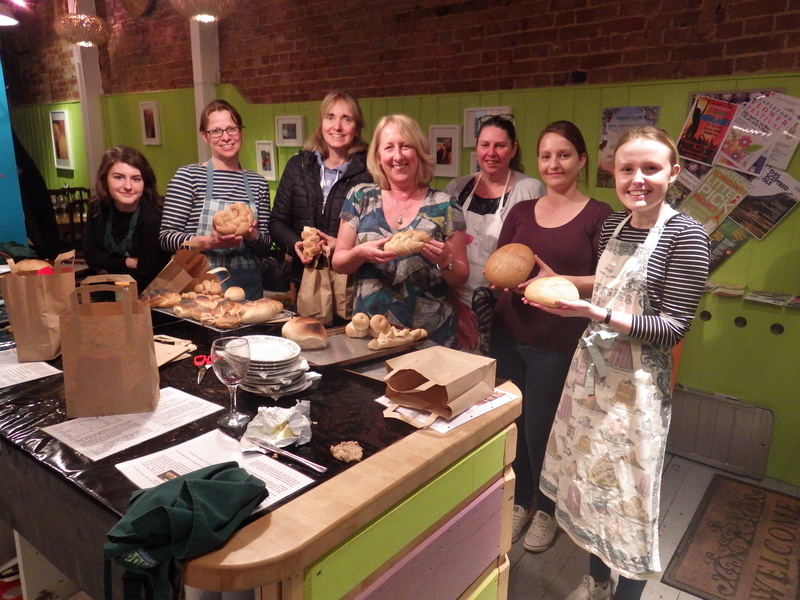 We had eight ladies turn up to learn the basics of breadmaking and some impressive loaves and rolls were produced. Christmas breads: Panettone, Stollen and Kangellangd. This entry was posted in Uncategorized on April 20, 2017 by tridenthousebandb. This entry was posted in Uncategorized on March 29, 2017 by tridenthousebandb. Having had delicious lunches and cakes at Mudlarks catfe in Hertford (http://wordpress.mudlarksgarden.org.uk/mudlarks-garden-cafe/), I offered to run a bread making workshop for them with all profits going to the Mudlarks charity. It is a bit of an experiment but, if successful, will lead to a series of workshops through the year with seasonal breads and more advanced techniques. 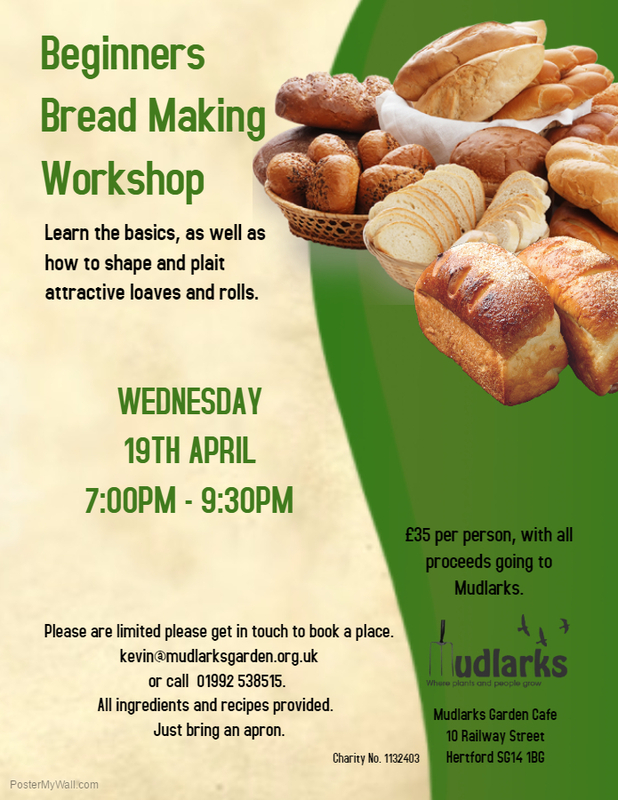 So, if you have always wanted to bake bread or need a refresher, please come along. The venue is 10 Railway Street, Hertford, SG14 1BG and it will run from 19.00-21.30, Wednesday 19th April . Please email Kevin to book a place: kevin@mudlarksgarden.org.uk. 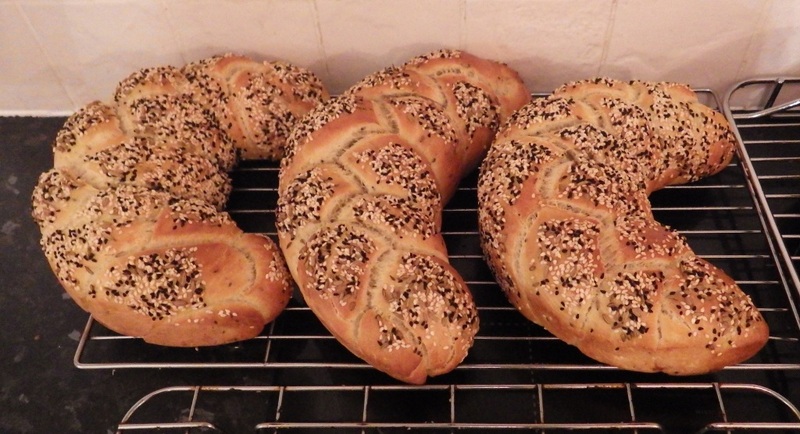 This entry was posted in Bread, courses, Hertford, hertfordshire and tagged beginners, Bread, charity, courses, Hertford, Mudlarks on March 28, 2017 by tridenthousebandb. What can a course cover? Almost anything you like. The photos below show the output from our last course which included basic white and granary loaves, focaccia, panettone, pesto swirls and spiced marzipan dessert bread. 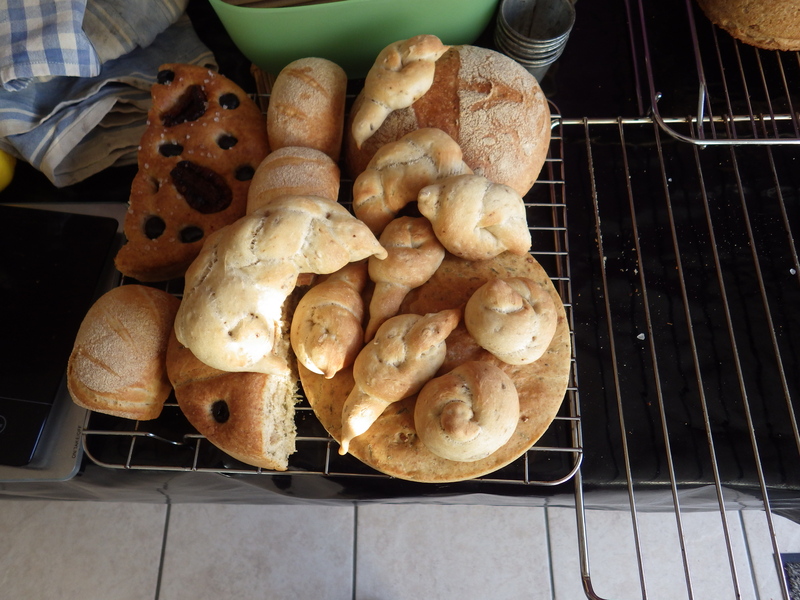 We also covered shaping, knot rolls, 3 and 4 strand plaits, cottage loaves as well as small rolls for dinner parties and ‘shots’, very small rolls with olives in the centre. This entry was posted in Bread, courses, hints and tips, recipes, Uncategorized on February 7, 2017 by tridenthousebandb.